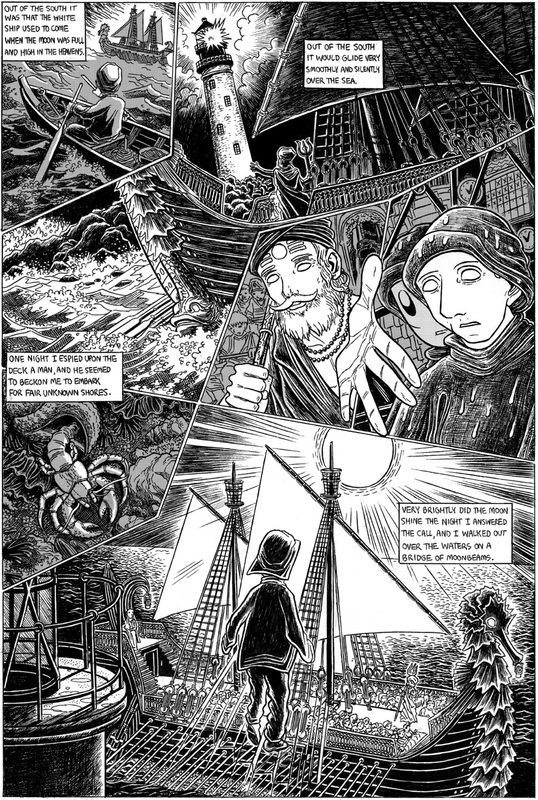 This page was a lot of fun to draw, and I’m happy with the design I came up with for the helmsman of the White Ship. The extreme camera angles and panel layout were influenced a bit by manga I was editing for VIZ at the time. Man, Lovecraft is leaving even the halfhearted attempt at realism behind completely here. By the way, these look so much more… hmm, “exacting” than some of the pages from the more recent story (although some are just as detailed, for example the very first and last pages). I’m guessing you simply had more time to spend on them? Or were you just in a different state of mind at the time? It kind of looks like they were drawn on bigger pages, actually. Isn’t this posted before your reboot? @Brian – Yes, I posted this way back in the day on another site, girlamatic.com. So it is a repeat, although the girlamatic stuff has been offline for two years and was also hidden behind a pay wall (at least on-and-off). Did you see it then? @Esn – When I look back at some of these White Ship pages, they’re definitely more detailed than “Strange High House.” Partly for that reason, there’s some Strange High House panels and pages I’d like to redraw (indeed, there’s one full page I *have* to redraw, since I lost both the original art and the high-res scan). Part of it is because The White Ship is so full of detail as a story that I felt it merited a super-detailed adapation, whereas “Strange High House” is more real-worldly. It’s a little of everything. Oh no, I meant that that’s Randolph Carter, behind the two main figures in front. He’s drawn in a completely different style, and someone who hadn’t read your earlier work would wonder why (well, I haven’t read it so much as seen the movie, actually). I guess you could consider it a recurring theme in my Lovecraft adaptations. It’s not actually Randolph Carter, though it looks the same. All people want to get a docortal degree, but what is the best way to have that? We would suggest to search for the thesis writing service to buy the thesis proposal just about this good topic from. I used that and had got really good level.